PARIS – I can confirm on my second visit to the Rush Bar open mic in Paris that this place is really cool. As it turned out, I was late to arrive, and despite a very full list and an open mic that had to end precisely at midnight, the MC made room for me to play as the last man on the list, acoustic. It turned out to be a huge pleasure, despite my fear of confronting a large audience without a mic for the voice or amp on the guitar. That was the way I was treated personally, but the other positives were the huge crowd, the great vibe and a new batch of musicians I had not seen the last time I was there. In addition to a few of the same. The bar is soon going to have a new owner, and the new owner also happened to be there and assured us that there would be no change in the attitude toward the open mic. So long live the Rush. And I noticed that Charlie Seymour, the MC at the Rush, apparently used that word “rush” near the end of the night without noticing it, as he said they had to rush along and do only one song per person when near midnight in order to let everyone play. So it is that after using the silly pun in my post a couple of weeks ago, I could not resist using it in a different way in my headline above. Yes, after performing in the Rush bar I was still hungry for more. So I rushed on over to the Bastille in cab, as it was only a few minutes away and I knew there was another open mic at the Some Girls bar. Unfortunately, when we got there, we found that that open mic had also ended some 20 or so minutes before. 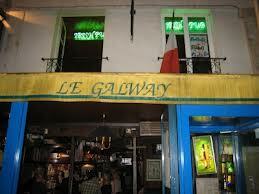 So it was that I decided to rush over the more distant Galway Pub open mic at the Place St. Michel, again in a cab. There, I found the stage occupied, and the wonderful Tess running the show as quietly and efficiently as ever, and she offered to let me play, despite her having already announced to the crowd that the open mic was about to end. I got to do four songs! And then it turned out another late-comer got to play as well. And so it was that the Galway open mic must have ended at around 1 AM or later. And once again it confirmed my warm feelings for this longstanding open mic in Paris, which has changed MCs three times since I started attending in 2008 or so, but which has maintained its quality and standards…. It was all worth the rush…. PARIS – Now that is the first time I’ve seen a woman at an open mic singing “Blinded by the Light” by Bruce Springsteen! Or maybe I should say that it is actually the first time I have seen ANYONE at an open mic singing “Blinded by the Light” by Bruce Springsteen. But not only did it inspire me just now to pick up my guitar and seek out the chords and lyrics myself to give it a try, but it also made me realize in just what good hands the Galway Pub open mic is now after having passed from the second or so generation host – All the Roads – to Tess Liautaud. Nor should I be surprised about Tess singing Blinded by the Light – after all, this is the woman who got invited up on stage by the Boss himself at Paris’s Bercy stadium (it has a different name now, I believe) a few weeks ago to join him for a song on guitar and vocals…. Anyway… back to the open mic. It was a quiet night in August, with half of the open mics closed down for the month of streets emptied of Parisians by night, but full of tourists, and I decided to check out the Galway and Tess’s new presentation of the evening. And there, I immediately discovered that not only was I seriously low on battery power on my Zoom recorder, as well as seriously low on my telephone, as well as having no charger for the phone and no charged batteries for the Zoom, but I was also around No. 10 or 12 on the list at the Galway, and it was 3 songs each and after 10 PM when it all started. So having met a friend at the Galway who suggested we go check out a band at a bar I’ve never gone to, I accepted, and decided not to perform. So off we went to the Guinness Tavern, a Paris institution for live music, with house bands that play until after 4 AM every night – I think it’s every night! Located on the rue des Lombards, I did notice that across the streets, the Duc des Lombards, the famous live jazz music joint, was closed. That was either because it was Monday, or again the month of August. No idea. Anyway, we stayed an hour and a half or so and listened to the highly adept band play hits from the time of Blinded by the Light until today. And had a nice time listening to the band, Jesters, and when the musicians saw a couple of us had guitars, they even invited us at the break to go up and play. I will regret it for the rest of my life that I did NOT go up and play. How dumb of me. How unlike me. I’m always ready for a musical adventure. I guess I was feeling my music was so different than what the band was doing that I’d only let either me or the spectators down – but now I regret it. Oh well, the Guinness Tavern will stay there, I assume…. And so, the good news is the Galway continues despite the departure of Romain “All the Roads.” I’ll miss his time there, but at least we still have the joint, and a fabulous new host…. Decidedly, the calliope has not yet crashed to the ground! P.S. How strange is memory. I discovered as I was adding the tag for Guinness Tavern that I had actually already been to this joint, way back in 2011, just for about half a song or something, as I was clearly not impressed at the time! PARIS – Monday and Tuesday in Paris. Didn’t know if I would stay in or go out. Chose to go out each time, kind of late each time, too. Ended up going to the Bastille, playing at Some Girls open mic, walking past and poking my head in the window of Yellow Mad Monkey open mic (both of these are on the Rue de Lappe) and deciding I was too late to sign up at that monkey one, so went off to the Galway pub open mic, for the first time in months. It was the midway point, or not even, of some great nights at open mics in Paris. Tuesday night was another matter: Returned to the Café Oz open mic for the first time in a very long time (playing) as well, and found myself third on the list as I decided to eat dinner in first in the nearby raclette restaurant. But here again, like at the Some Girls, there was chatter that was louder than the sound system. So here again, I decided I needed more intimacy. So after my set at the Café Oz I headed on over to the Pigalle Country Club where I met… the friend from the Saturday pub crawl and the Galway the night before…. He was with someone new this time, though! Well, it turned out the Burnin’ Jacks who usually host the open mic at the Pigalle Country Club were not yet – or just not at all – there, so I asked if I could take to the “stage.” It was agreed upon immediately, and I did about a half hour set. More talking, of course, much, much talking. But I really enjoyed playing for myself, and a few people spotted about here and there who listened. From there, it was off to the Féline… but by the time I arrived, the open mic had been so long since finished that the stage was entirely naked of any instruments. No problem. I decided to saunter over to the Zebre Rouge bar for the Tuesday night jam session. It was in full swing when I got there, and never ceased to be in full swing. I took out my guitar and played along, played some lead, but sitting at a table, having a beer, and not plugged in. I then went into the back room, played some chords, and decided that the evening was far too reggae for me, and I headed back home. But with three open mics played at in one night, and two the night before, that was about all the fun I needed in Paris for the moment…. PARIS – Last time I posted I was blaming Paris for being in Christmas-break mode and not having so many open mics as usual. Now I must lay blame on myself for being in Christmas break mode for not posting on this blog this week despite doing three or more open mics! In fact, I’m not in any kind of true “break” mode; I’m in overdrive on my own projects in the areas of my life where I am not yet earning my living, but where I still have ambitions: Editing my open mic film, putting together a CD, working on novels, memoir and other projects. To say nothing of household chores and a minimum of socializing. So here is a short report on Sunday, Monday and Tuesday open mic adventures in Paris…. Sunday it was off to the O’Sullivan’s Rebel Bar open mic near Chatelet, where Etienne Belin held court again for his weekly open mic in this fabulous and cool bar, which also hosts a billiards tournament during the open mic. Now THERE is a solution for all the bars that are not sure they want to do an open mic for fear of alienating other sectors of their patrons: Do everything at once! I heard some nice stuff, met some nice people, and generally had an excellent time. Monday, it was off to my first visit to the Galway open mic for a long long time. It was not the usual MC, but rather Thomas Brun, who is the MC of the Highlander open mic. And Thomas, as any reader of this blog will know, is a consummate MC of open mics…and a wonderful musician. I had a video of him opening the evening’s show, but unfortunately I was placed behind a very, very, very loud group of Americans who were standing at the bar just in front of Thomas, and in the video as at the pub, it’s not so easy to distinguish anything between their loud voices and his music. I can’t understand how anyone on earth can be in a bar directly in front of a small, intimate stage with a single musician opening a show, and how they can continue to yell at the top of their voices about nothing at all…. Fortunately, the group went outside eventually to talk – they had the upper floor and the back of the bar, if they wanted – and the evening went on in acceptable manner. Tuesday, I dropped by Brislee Adams’ excellent Café Oz open mic in Pigalle, but it was too early and he had not yet arrived; so I could not put my name on the list. I went down the street and had a meal of raclette with a newfound friend, and then after the fabulous meal, we went back to the Café Oz, to find the place just brimming with open mic musicians, and a list that was so long I knew that although it was only 10:30 p.m., I would not get behind the mic until 1 a.m., if at all. So we left and went to look for a place to have a drink, and that’s when it came into my mind – after visiting one or two other noisy bars – that there was the Pigalle Country Club open mic, run by my friends of the Paris band, “The Burnin’ Jacks.” This is a fabulous, very little publicized open mic that is used mostly by the Burnin’ Jacks and their friends. But that is by no means the point of the thing, so anyone can go and grab the stage, mic, guitar, and play away when it’s free. So both I and my friend did play, after hearing much fun rock ‘n roll and Buddy Holly played by a couple of the Burnin’ Jacks, and others….